Tippy Tippens is a design maven with a bent for social entrepreneurship. In fact, when the BP oil spill disaster happened in 2010, Tippens was living in far-away New York City, but felt pulled to do something to help. Her many visits to New Orleans culminated in eventually relocating there and starting her business, Matter Inc., which is dedicated to "making the world a better place by making meaningful products that matter." That's how BirdProject Soap was born. These black, bird-shaped soaps are made from natural, local ingredients (including biodiesel glycerin and activated charcoal, which lends them their eye-catching color). The soap itself is gentle and lightly scented, and the bird fits perfectly in your hand, wash after wash. Such a wonderful symbol of the creatures affected in the Gulf should be a lasting one, so as you use your soap, it melts away to reveal a ceramic bird keepsake that’s handmade by Tippy from Louisiana Clay. The best part is that 10% of the profits go towards the Gulf Restoration Network and International Bird Rescue. It's beautiful design, and help where it's needed, for the beautiful creatures that inspired it. Just Brilliant! This artistic entrepreneur, Tippy Tippens, deserves to be more than successful; she deserves our gratitude (and some major design and humanitarian awards!). Her soap melds function and form, as well as material type and source, giving birth to a business model that, if widely adopted, could effect broad scale environmental change, as well as a major shift in our greater social consciousness. Beyond serving a useful proximate purpose; they directly and indirectly begin to rectify past damage caused by a related industry to a specific environmental location -- in multiple ways. Truly laudable innovation! Please forward my comment to Ms. Tippens for me! And thanks to you ladies at Daily Grommet for helping to bring this kind of genius to the marketplace - and the awareness of the general public! Love these, and the whole concept. Thank you for what you are doing. One quick question. How many washes (of course an estimate) do you get out of the black bird before reaching the white one? @Carol Anderson: Hi again Carol! A friend sent me this picture today and it reminded me of your question, she's had hers since December [at her sink]. All of the birdies wear differently depending on how they are used of course, thought this one looked cool! 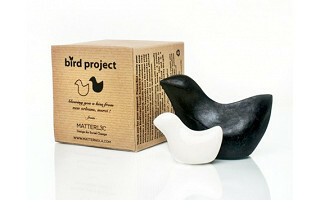 I'm so glad that you love the BirdProject and appreciate the work and mission of Matter! I greatly appreciate your understanding of this new business model too! Merci Beaucoup Peggy & Daily Grommet! It's really dependent on how you use the soap, whether in the shower or at the sink. In the shower the birdie wears faster, but at the sink have heard many people still have theirs from December! I absolutely love your product and its cause! I would really like to place an order. My daughter will love them, and I even have a couple people in mind that would enjoy them has a wonderful gift. Keep up the good work!!! Is this $24.00 for one soap? Can't find this info in the ad. 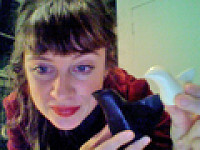 @lakelady: Yes, it is $24.00 for the soap with the ceramic bird in the center. Fabulous idea! I live in New Orleans, and I appreciate your help to clean up the BP mess. My daughter (12 at the time of the spill) designed a bracelet made from recycled pop tops from aluminum cans. She made them all to order with special charms like pelicans, oysters, crawfish, turtles etc She raised 1,000.00 all donated to the cleanup project. So again, thank you and do u sell locally since i live in NOLA? I really want to order some, but Im not seeing how to place an order. Can you please email the information I need to place an order? Hello Autumn, Many thanks! Look on the right hand side of the page for the ordering section [to the right of the movie]. Please tell us where the other 50 percent of the donations go to. Thanks. @elizabethanne: Sure thing - 50% goes to Gulf Restoration Network & International Bird Rescue, the other half goes to my new company MATTER L3C, Design for Social Change. I googled " Gulf Restoration Network" to see if you were a supporter or partner. 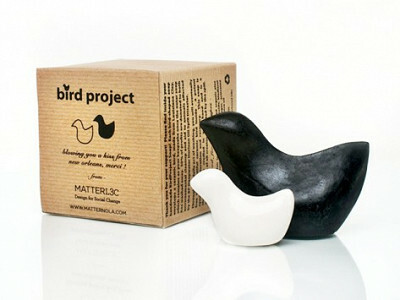 Bird Project and Matter L3C does not appear. Please explain, thank you. @Kim: You can find me listed here, thanks. This is a wonderful product. I sell the birdie soaps in my shop and I hear first hand how much people love them. The best testament is from customers who come back for more -- both for themselves and to give as gifts. Congratulations Tippy! Thank you for this wonderful idea and your commitment to a worthy cause. It seems you are out of stock. Will I be able to order a few before Christmas? @Carole Light: Thanks for letting us know that you weren't able to put these into your shopping cart. We have fixed the error and they are orderable again. out of stock.Will we be able to order this year? @kathy victor: We hope to have the BirdProject back soon. You'll get notified when available. Thank you for your interest. Hi & thank you! @ Celeste So glad that you the Birdies & I completely agree, their scent is heavenly & lasting! Sorry, my fingers weren't in sync with my brain...2 typos..."not yet given" and "though" should be "thought"
@ Celeste I totally understand : ) let me know if you meant something else by baby birdies. I absolutely love this project....however...what is BIO DIESEL? @ Dianne McGrede good question! You can find the answer at http://www.biodiesel.org/ Thank you. Tippy Tippens is a design maven with a bent for social entrepreneurship. In fact, when the BP oil spill disaster happened in 2010, Tippens was living in far-away New York City, but felt pulled to do something to help. Her many visits to New Orleans culminated in eventually relocating there and starting her business, Matter Inc., which is dedicated to "making the world a better place by making meaningful products that matter." That's how BirdProject Soap was born. These black, bird-shaped soaps are made from natural, local ingredients (including biodiesel glycerin and activated charcoal, which lends them their eye-catching color). The soap itself is gentle and lightly scented, and the bird fits perfectly in your hand, wash after wash. Such a wonderful symbol of the creatures affected in the Gulf should be a lasting one, so as you use your soap, it melts away to reveal a ceramic bird keepsake that’s handmade by Tippy from Louisiana Clay.